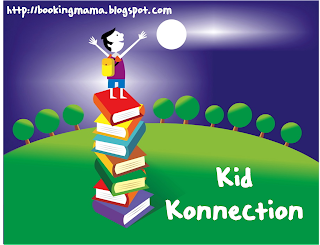 Welcome to Kid Konnection -- a regular weekend feature here at Booking Mama about anything related to children's books. Today, Booking Daughter and I are going to feature a book that we recently read for our after-school book club! As some of you might already know, I am running an after-school book club for 4th and 5th grade girls. This month, I picked A CROOKED KIND OF PERFECT by Linda Urban for us to read. I have heard so many good things about this book from other book bloggers, and I am so grateful for their words of advice because this book was just PERFECT for these girls. We had an amazing discussion for over an hour -- and I have to admit that they stayed on track with the book way better than my grown up book clubs do! After our meeting, one of the girls told me that this meeting was definitely better than our last one! On one hand, I was really happy to hear that because I want the girls to have a good time; but on the other hand, I was a little disappointed that the last meeting might not have been as fun as I had thought. Oh well! I think it helped that all of the girls thought this was a fantastic book. A CROOKED KIND OF PERFECT is just a wonderful story for tweens. Zoe's home life is far from ideal -- her mom works all of the time and her dad has some issues which make it difficult for him to leave the house (and even have a job.) Zoe doesn't seem to fit in with the "cool kids" at school either. She just wants to be special. In fact, she decides that she wants to be a child prodigy like Horowitz; and she desperately wants her parents to buy her a piano. Instead, her father gets her an organ, the Perfectone D-60. I found this book to be terrific on so many levels. It is very appealing to young girls because the story is told in brief chapters from Zoe's viewpoint. In addition, this book is just chock full of humor that both kids and parents can appreciate. We actually took turns at the meeting talking about every one's favorite funny part and we found ourselves giggling all over again. But what I think young girls (and moms) find so wonderful about this novel are ultimately the messages in it. What Zoe experiences in this book are feelings that all young girls have -- feeling like an outsider, being embarrassed of her parents, having issues with her so-called friends, not ever seeming to get what she wants, not knowing what clothes are cool, not being part of the popular crowd, etc. I mean, who can't relate to that? We spent a long time during our meeting talking about how normal it is to have these feelings. I even told them that grown-ups still have them (but with a little more perspective.) I was so impressed that every girl shared something although there were some who were more open (and talkative) than others. I had a feeling that we might end up discussing the "mean girl" syndrome and cliques. I was a little afraid to go there because I don't feel like I'm equipped to handle it, and I was worried that things could go downhill fast. However, I think every girl there wanted to talk about these mean girl bullies (or as we decided to call them -- the queen bees.) We talked about why these girls might act this way -- maybe insecurity, bad home life, peer pressure, etc. The girls admitted that they would keep these things in mind the next time they were being picked on, but I know how hard it is not to show your feelings of hurt and embarrassment. We all agreed that this book had a great ending. We talked about how the characters changed from the beginning of the book until the end; and we also discussed some things we learned. Many of the girls really loved Zoe's friend, Wheeler. They were very quick to point out that he was a very upbeat person who didn't judge others. They liked that he was comfortable in his own skin, and they all wanted to find a friend like him. I was thrilled that we were able to touch on everything I could think of to talk about A CROOKED KIND OF PERFECT. One of my favorite parts of our discussion was when the girls gave their interpretations of the title. I was blown away by how insightful some of the girls were! I definitely liked A CROOKED KIND OF PERFECT better than the last book we read -- A VIEW FROM SATURDAY. It was funnier and the chapters were shorter and easier to read. My favorite character was Zoe's dad because he was so funny, but I also liked Zoe's piano teacher who was also pretty silly. I liked a lot of book, but I had a few favorite parts like when Zoe's dad ended up buying 432 rolls of toilet paper. I also liked how Wheeler, Zoe's friend, always came to Zoe's house and hung out her father and baked with him. I thought Wheeler was an interesting character because he was always stayed cheerful. My favorite of the book was when the ending, but I don't want to spoil it in case you haven't read it. I hope there is a sequel, and I have lots of ideas about what could happen. I think girls my age will love this book. I couldn't agree with Booking Daughter more. I can't imagine a tween girl not loving this book! I highly recommend it, especially for mother daughter book clubs! Here is a link to a few discussion questions. This was a huge hit at our Scholastic Book Fair a couple of seasons ago, especially with the 10 to 12 age crowd. My daughter read it and loved it. It makes my heart feel good to hear about your book club experiences. What a wonderful opportunity you have given these girls! First, it sounds like you have a fabulous group of girls in the after-school book club. You should be really proud of yourself -- and the girls. Both your and Booking Daughter's reviews make me want to the read the book. I wish my niece was still young enough for this; it would be fun to read this along with her. Of course the second meeting was better than the first - the girls knew what to expect going into it. The book sounds perfect for that age group. I love Booking Daughter's thoughts. And I don't think I could resist a book with two characters named Zoe and Wheeler! Sounds like you are doing a GREAT job on drawing the girls in for the bookclub. I'm impressed anyway. =D It's hard work to plan for that and get it going. I'm so glad to hear that the book group is going so well ... you and Booking Daughter might need to take the show on the road and teach other groups how to do it! I amended my review to include a link to a few discussion questions. I hope it helps!